As many people already know, earlier this month a devastating Category 5 super typhoon made landfall in the Philippines, leaving a chaotic mess in its path. 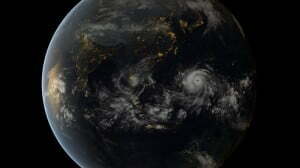 Reportedly, typhoon Haiyan sustained winds of up to 195 mph, wind gusts reaching 235 mph, and over 27 inches of rain, unofficially making it the fourth most intense tropical cyclone in history. SunMaxx Solar partnered with RTD Energy & Power in February for a solar hot water installation at the Amanpulo Resort on the Pamalican Island in the Philippines. This tiny island is only 500 meters across at its widest point, and unfortunately, is located near the storm’s direct pathway. A report released today confirms SunMaxx ‘s solar hot water system withstood the storm, and is still fully functional and running. On-site installer Ron Del Valle reports, “The RTD/SunMaxx solar thermal system survived one of the largest typhoons to hit the Philippines and the biggest to ever hit the resort!” As telephone communications and internet connections are being restored, SunMaxx Solar’s thermal solar hot water system is fully operational and has “no leaks” while the “pressure remains stable”. SunMaxx Solar strives to bring the best most efficient solar energy technologies to its customers. The company is known for its focus on quality products and reliability. As SunMaxx Solar continues to grow every day, the company remains dedicated to building a sustainable future for our global community.